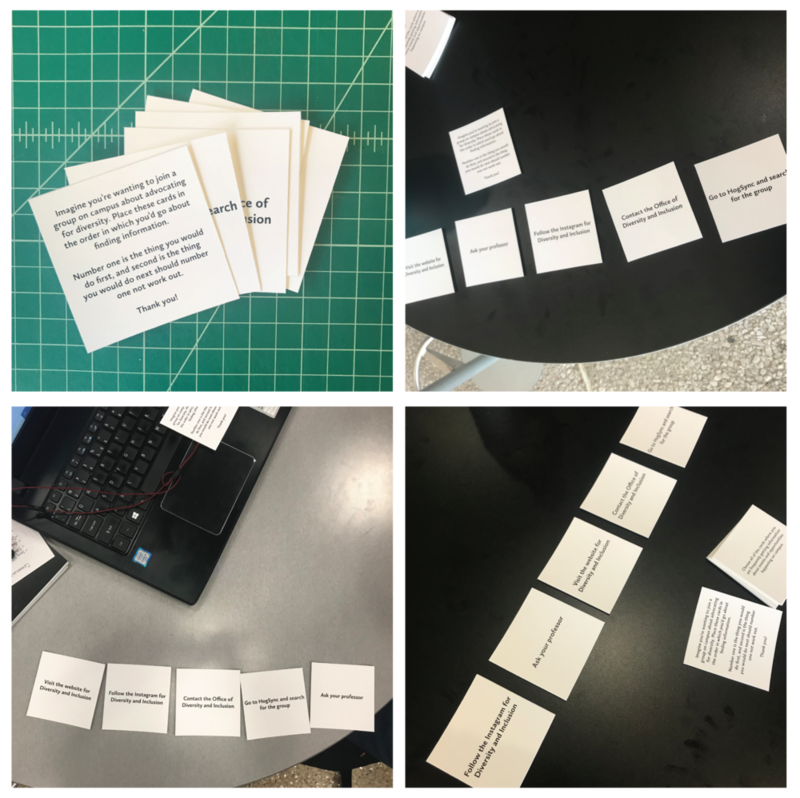 In trying to discern why it is that college students do or do not engage with Diversity and Inclusion efforts on campus, I set out to conduct four different IDEO methods of research: Surveys & Questionnaires, Extreme User Interviews, Word–Concept Association, and Card Sorting. For all of these methods, the group of people that I wanted information from was my peers or college students who are currently enrolled in classes that take place on this campus. I wanted to see what their awareness level was for D&I efforts, but more specifically if they new about the student run Ambassador program. The survey included questions that were more data driven and was done in a way to simply get information about how students feel about D&I and if they know about what’s happening on campus with D&I. From this, I gleaned that over half of the students that took the survey were interested in D&I, but only half of them knew about initiatives on campus and even less knew what the Ambassador program was. Something I think worth noting here is the amount of different on campus groups that call themselves Ambassadors. It wasn’t until later on in my research that I found out the group is actually called the Diversity and Inclusion Student Council, which is something that the D&I website does not mention. Next, I conducted Extreme User Interviews. For my purposes, I wanted to interview someone in the Diversity and Inclusion Student Council and someone who doesn’t know anything about the group. I interviewed Daniel Marsh, a senior and the President of the group. He explained that the group is fairly new, having started in Fall 2018, and was the result of a new wave of D&I student involvement that was prompted by an incident on campus that involved blackface. At first it was a group that was an extension of the Office for Diversity and Inclusion here on campus, but the students and faculty involved felt that they needed to transition to an RSO for better structure and connections among the campus. Right now, they are mainly collaborating with other RSOs to talk about the importance of D&I and are in the process of forming committees that will work more specifically on different sections of D&I, such as race, sexuality, and disability. With these interviews, as well as the survey, I wanted to figure out where students are spending their time on social media. I asked everyone what their most used platform was and it was predominately Instagram. I also asked Daniel whether or not the group had any sort of social media platforms, and if they didn’t, how they were going about getting the word out. He said that they didn’t have live social media pages yet and that they were currently just working through word of mouth and the Office for Diversity and Inclusion. Next, I wanted to glean what students associated with D&I overall. It went as I expected, which all responses having a positive association, however, it kind of made me think that D&I should be defined more clearly to help students understand what it is that the initiatives are trying to achieve and why it matters. Lastly, I wanted to see the ways in which students would go about finding information about initiatives and the Diversity and Inclusion Student Council. 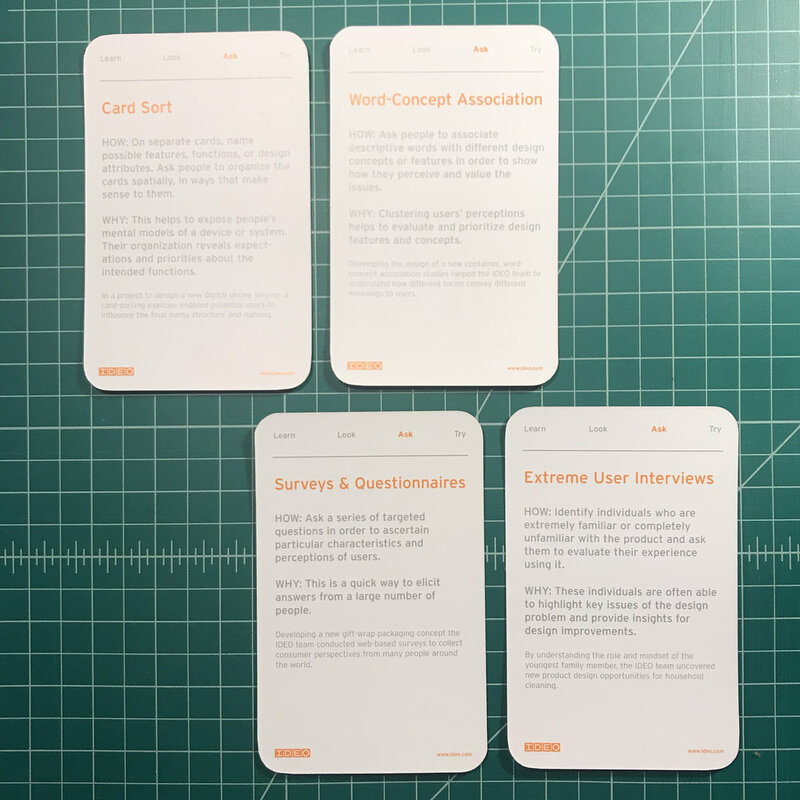 I gave participants a small set of five different cards and asked them to sort them according to the order in which they would go about learning more about a group that advocates on campus. I found that this was much more attractive for people to participate in, as it gave them more to do and more to think about than word associations. The information I got was also more relevant to my overarching goal of how to engage students in these groups or initiatives. Most people put that they would visit the website for D&I, followed by searching for it on Instagram. Knowing that students would visit the website first makes me think that there needs to be a greater consistency on how to refer to Diversity and Inclusion Student Council and how to go about joining it, since it is indeed an RSO. Powered by Squarespace and soy lattes.